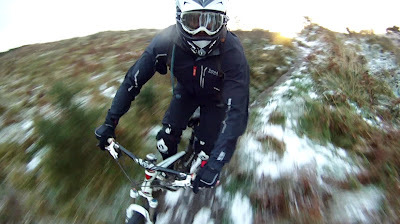 We go to Scotland Mountain biking very regular because we dont have anything like it here 'YET'! One of our favourite spots is AE Forest near dumfries. Was over yesterday and had the best day I have had on the bike in a long long time. Loved every minute of it. Here is the pic of the Day captures an awesome days craic. Me Jumping my mate who was just glad I cleared him. Great pic. Do you just do a day return on the boat and drive up? Yeah 7:30am over and the 11:30pm weekdays or 11:59pm Sunday back. Car and 4 is £100 for nothing. Stop of for food on the way home and just cruise down to the boat. That's a keen price. I've always hoped that a decent weekend foot passenger package might appear so we could do an overnighter in Galloway Forest Park. It's one of the darkest spots in Europe but only 30 miles or so from the boat. Galloway is massive. Part of it has the MTB trail centre Kirroughtree. We have done night rides in there and the wildlife is amazing. They do regular sky watcher nights around there for that very reason. A great place to view stars etc. If your ever looking that day trip price. Go to the stena website day trips then Mountain bike day trip. No good for an over nighter i know.